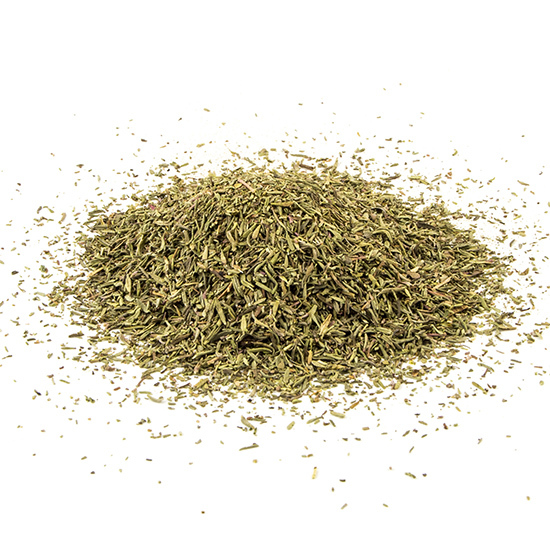 Thyme originated in the southern Mediterranean region. A perennial in the mint family of plants, thyme is a small, attractive herb with a plethora of small white, pink, or lilac flowers. Incredibly, there are more than 350 known thyme species, undoubtedly because they hybridize so easily. The most common types used in cooking are Thymus vulgaris (common thyme). Thyme was associated with health and vigor and believed to strengthen and purify the body. Today, its essential oil, thymol, still has many therapeutic applications. It is widely used as an antiseptic and disinfectant. Infusions of thyme are believed to be an excellent remedy for respiratory, throat ailments and even hangovers. Besides for its long history, thyme is one of the most popular culinary herbs today. Thyme is frequently used in Mediterranean, Italian and French cuisines. It pairs well with lamb, poultry, and tomatoes, and is often used in soups, stews, stocks, and sauces. Other herbs with which thyme can be successfully combined include rosemary, marjoram, parsley, oregano and bay leaf. When cooking with thyme be sure to add it early in the process so the oils and flavor have time to be released. This herb is great when used fresh and goes well in many typical southern Italy pasta sauces which often feature peppers and eggplants. Thyme is also a great compliment for many vegetables, including tomatoes and roasted potatoes, and many grilled and oven roasted fish recipes too. Thyme is a fragrant, small, hardy, evergreen, perennial shrub that prefers a mild climate but can survive temperatures below freezing. It tolerates cold better in well-drained soil. Plant thyme from seed in early spring, two to three weeks before your average date of last frost. Small lilac to pink flowers appear at the end of leaf stems in summer. Pick thyme as needed, the leaves and sprigs can be harvested at any time. Thyme is a charming, cheerful little plant and will last for years once it’s established.